Spontaneous Euphoria: Lots of Updates! So there is a lot that I need to write about in the world of cooking! The chocolate cooking class that I took, the pink layered cake that I baked, the lemon cake I made, the hokkien noodles I stirfryed for dinner one night, the soufflé I made tonight, the numerous cooking shows I've been watching, and the tea party I threw for my really good friend! The Chocoladdict cooking class was the second cooking class that I took at L'atelier des Chefs Dubai. We made cookies, cupcakes, a fondant, and a soufflé. My favorite two recipes of the morning were the soufflé and the fondant. The fondant was self saucing in the centre and the soufflé has to be the world's best I have ever tried (which I recreated today!). I never knew that soufflé doesn't require flour as such. Apart from very little cornflour, there were no grains at all in the soufflé. We placed raspberries in the center of each ramekin and this added a lovely flavor to the entire dessert as the sweet chocolateyness of the dessert was broken up by the sourness of the raspberries. Next up is my "lovely" pink layered cake. I wanted to make a slightly more complex, professional cake so I decided to bake a three tiered plain butter cake. All that worked out perfectly. I wasn't in the mood to make the icing/fondant so instead decided to make a pale pink buttercream. I ended up added a lot more red icing than necessary so it turned into a darker pink than I intended it to- in fact it ended up looking like barbie pink. Anyways, I was carefully using an icing knife and coating the cake when my trusty assistant :) decided to take the entire bowl of buttercream and pour it all over the cake. I watched in horror as the buttercream became soggy and dripped all over the cake, and had flashbacks of the pink goo the characters were after in the Power Rangers movie I used to be addicted to. Anyways, I tried to salvage the cake by removing the excess however it looked better once it dried slightly than it did initially. I ended up adding little pink cake decoration hearts and pink flower shaped icing to the top of the cake.. and it looked like a birthday cake for a five year old girl who's into ballet. BUT, the important thing is whether it tasted good, WHICH IT DID! So, looks can be deceiving, as always. Last Sunday I decided to make something quick and easy for dinner so instead of going for the usual easy solution: pasta, I decided to make Asian noodles instead. The recipe I used was from Australian Women's Weekly Vegetarian Stir Fry. I've made this before and it was a big hit so I decided to go for it again. However this time, hokkien noodles weren't available in the supermarket and so I had to go for Pad Thai. Also, I accidentally ended up with creamy instead of chunky peanut butter. It tasted nice but for some reason not as spicy as last time, which was a bummer since I'm a junky for anything beyond spicy. interesting shows where eight pairs of people compete for the top spot by each opening their own little restaurant for a period of time. The lemon cake I made was also nice as it was a plain cake which I then spread with a lemon juice/sugar mixture while it was still hot. The liquid seeps into the cake and flavors it wonderfully! Well last thing I need to discuss is obviously the best! -- which is the tea party I threw for my friend's birthday. I made it very feminine. The tablecloth was white with random floral embroidery in pale pink, green and yellow. I threw a baby pink chiffon cloth around the center where I arranged flowers in a vase as the centerpiece. The flowers were baby pink and white roses, chrysanthemums, and carnations. I filled the rectangular vase with pebbles and poured water halfway up. I trimmed off the stems of the flowers and so when they were placed in the vase they looked as though they were suspended in mid air. What held them there was the close proximity of each flower to the other. I then took little silver arabic tea glasses and filled them with jellybeans and marshmallows. The crockery was baby pink and white and the cutlery was silver. As drinks I served water, and fanta! The orange color of the fanta added a really nice bright contrast to the table. There were also five thick cream colored candles I scattered across the table. Each place setting had its own white rose, the birthday girl however got a bright pink one! The plates also held one cupcake each, the birthday girl's cupcake was in a special "birthday princess" case with a crown on a toothpick sticking out of it. The chairs had swaths of chiffon wrapped around them with a rose poking out of the knot formed. 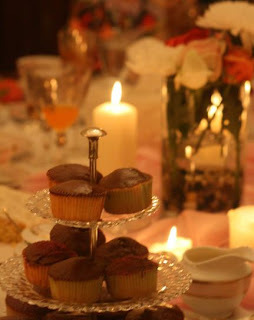 The menu was as follows: vegetable filled puff pastry, Lebanese inspired pickled chicken rolls, chocolate buttercream and vanilla cupcakes, plain floral shaped biscuits, chocolate mousse served in champagne flutes, and a coconut and lemon cake. I hope I can upload pictures! They never work for some reason! Spending time in the kitchen.